Each of the WJ IV batteries contains a “core” set of tests that provides a representative survey of abilities measured by the battery. Examiners can selectively administer additional tests to provide greater breadth of measurement in an area of cognition or linguistic competency or in a domain of achievement. 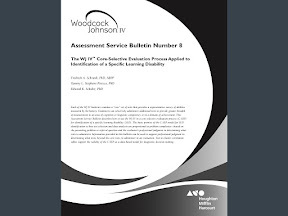 This Assessment Service Bulletin describes how to use the WJ IV in a core-selective evaluation process (C-SEP) for identification of a specific learning disability (SLD). The basic premise of the C-SEP model for SLD identification is that test selection and data analysis are proportional to problem complexity—based on the presenting problem or referral question and the evaluator's professional judgment in determining what tests to administer . Information provided in this bulletin can be used to support professional judgment in determining what tests, beyond the core tests, to administer in an evaluation. Test-to-cluster correlation tables support the validity of the C-SEP as a data-based model for diagnostic decision making. I did contribute the appendix which reports correlations from the WJ IV norm sample between all the Cognitive and Oral Language tests and the WJ IV achievement clusters at different age groups. We ran out of time to get this information in the technical manual. It should help with the design of selective referral-focused assessments, as described in the ASB.